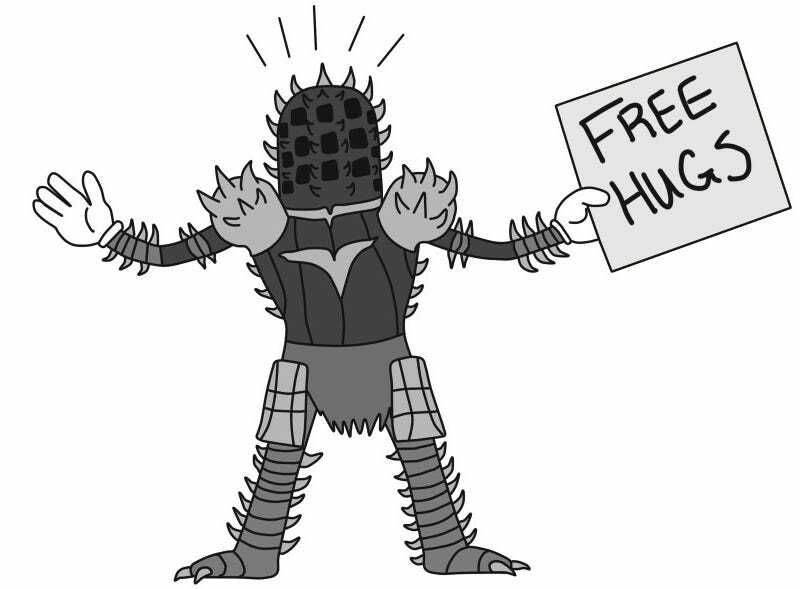 There’s no Dark Souls player we’ve featured on Kotaku as much as Iron Pineapple. He’s the guy who dressed up as Shrek to protect his swamp, donned spiked armor to run everyone over, and pooped on the ground to strike fear into other players. I decided to ask him the big question: why? “I’m just a dude who likes him some Souls,” he said in an email recently. Though he wouldn’t tell me his real name, Iron Pineapple told me he’s a 20-year-old college student pursuing a computer science degree in North Carolina. He was first introduced to the Souls series by his uncle. 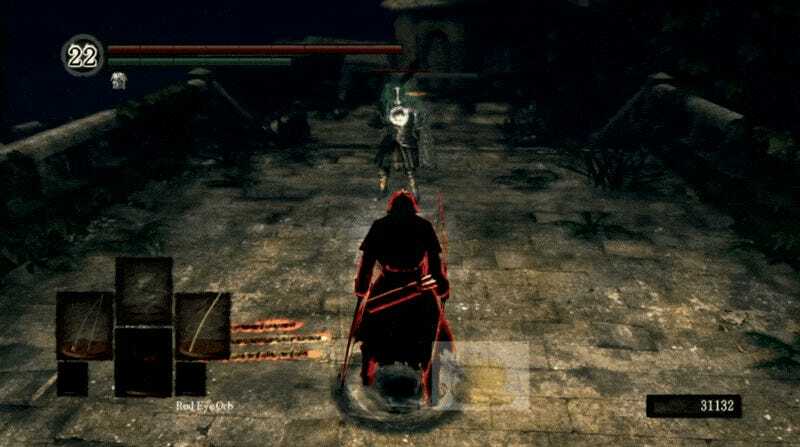 Demon’s Souls kicked off the Souls phenomenon in 2009, and though it takes place in a separate universe from Dark Souls, it carries the same design DNA. Bloodborne is the same thing—similar game, different world. It’s hard to top your first Souls experience. Iron Pineapple distinctly remembers a moment early on when he was playing the original Dark Souls and was suddenly attacked by three players at once—a dreaded ganksquad. Gangsquads tend to attack powerfully at once, and they’re total dicks. Impossibly, Iron Pineapple managed to fend off his attackers. Seeking that rush led Iron Pineapple to start messing with people online in more and more exotic and elaborate fashions. 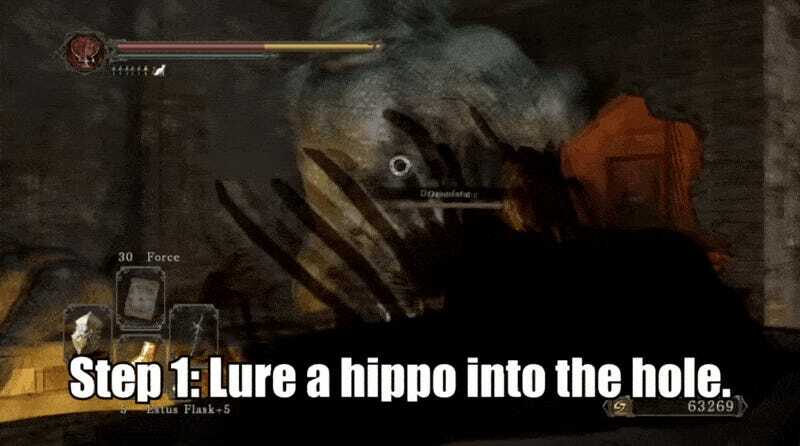 In Dark Souls, players can invade the worlds of their fellow travelers. Usually, the point is to kill them. That’s usually what Iron Pineapple is trying to do as well—but with gusto. His first video, published in November 2013 and dubbed Township Groove, is simple: he shuffles from left to right until slaying you with an arrow. Things began to escalate, as Iron Pineapple started putting more effort into the editing of his videos. We Will (Havel the) Rock You, set to Queen’s “We Will Rock You,” syncs up the song to the beat of swinging a huge club. As Iron Pineapple started to gain notoriety in the Dark Souls community, his costuming and setup became more inventive. He dressed up as Link from The Legend of Zelda, and tried to imitate Darth Vader in Star Wars. His most popular Dark Souls 2 video is...involved. First, he lures a powerful enemy—one who killed me at least a dozen times in that game—into a hole. Then, he litters the ground with loot, hoping to attract a summoned player. The moment they become interested, another player in hiding reveals themselves from the shadows, pushing them into a hole of horrors. He’s met a number of like-minded friends over the years, folks who join him online help create the videos. The group spends a couple of hours online—he estimates between two and five, depending on the video. Things have really taken off with Dark Souls 3, though. Making these videos is a hobby for Iron Pineapple, albeit one that’s gotten more and more popular over time. Two videos have already been viewed more than a million times, with his most popular topping 1.5 million views. You might remember it; the video was on Kotaku some weeks back. The victims of Iron Pineapple’s shenanigans aren’t usually upset, though. He does make money on the videos, but a number of them, including his most popular creations, can’t be monetized, because he uses real music. For now, he’s trying to capitalize on his growing popularity; videos are coming out regularly on his channel. The latest involves exploiting a glitch that allows him to cast a powerful spell extremely fast. You can continue to follow Iron Pineapple’s joyous exploits on YouTube.